We found these two lotions to be very similar in smell, ingredient panels, and after-feel. 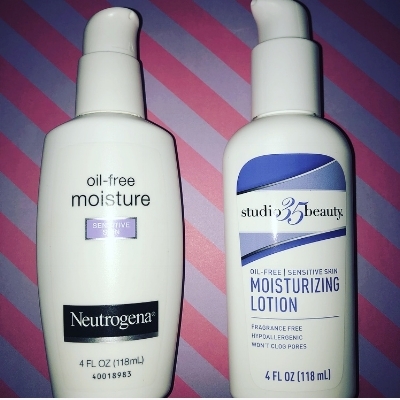 The Walgreens lotion (studio 35 beauty) was a little more watery at first, but once we shook it up, we found it had a nearly identical consistency to the Neutrogena version. This is a great generic to switch to! Brandefy compares off brands (e.g., studio 35 beauty) to name brands (e.g., Neutrogena) to show you when the store brand is as good as the name brand, and to warn you when it is not. Our purpose is to help you save time and money, and to have a good time while doing it. Welcome, Walgreens shoppers! We have decided to start comparing Walgreens generics to the name brands as well. One Walgreens brand is studio 35 beauty. They have several generics to choose from. We decided to start with this Neutrogena dupe because it is a popular face lotion, and you can check out our reviews of the up&up and Equate versions as well. We first noted the pump is well made and easy to use. The color and smell of both lotions is nearly identical. We were a little disappointed by the generic at first because it was more watery than the name brand. However, when we shook up the studio 35 beauty lotion, it came out almost the same as the Neutrogena. The ingredient panels are nearly identical, so we think you will find the generic similar enough to switch!